A private equity fund co-chaired by a former BlackRock Inc. executive is planning to raise US$250 million to invest in marijuana businesses in places such as Los Angeles, Las Vegas and midtown Manhattan. MedMen Opportunity Fund II, which looks for companies that cultivate, manufacture and sell pot, is setting up operations in the nation’s most popular tourist destinations. The effort is timely because New York recently added chronic pain as a qualifying condition for medical marijuana, California’s recreational market opens in 2018 and Nevada legalized adult weed use in July. 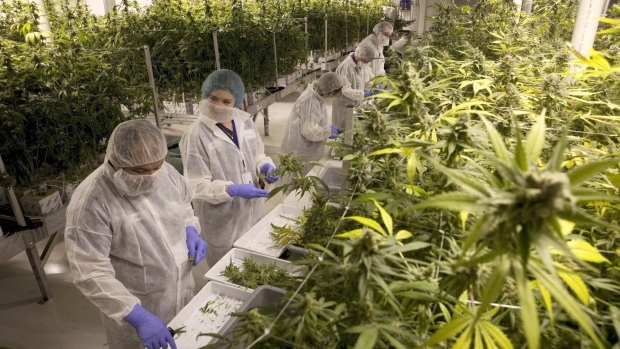 Canada plans to legalize the plant nationally by July. Reaching MedMen’s quarter-billion-dollar goal would mark one of the biggest investments yet in the nascent marijuana sector, which is still shunned by financial institutions skittish about a product that’s illegal under federal law. The industry is barred from most traditional banking services and faces political uncertainty from the Trump administration, where Attorney General Jeff Sessions is an ardent foe of state-sanctioned pot. But the same issues that might deter others -- the legal gray area and lack of widespread understanding of how the industry works -- make legal cannabis a savvy investment, according to the people behind Los Angeles-based MedMen, who raised $60 million last year for the group’s first pot fund. The assets are cheaper because of the risk, and fewer investors are willing to get into the space. “They were looking at markets where there was a lot of disruption and where there’s not a lot of transparency,” said Ruth Epstein, a former Goldman Sachs Group Inc. investment banker in San Francisco who bought into MedMen’s latest fund. MedMen’s Wall Street bona fides comes from its co-chairman, Chris Leavy, who served as chief investment officer of fundamental equities at BlackRock, the world’s largest money manager. Before that, he was chief investment officer of equities at OppenheimerFunds. The presence of Leavy, 46, who took the biggest stake in MedMen’s first round, is a big deal for investors who might otherwise be hesitant about a pot fund, Epstein said. “That was the thing that really pushed me to pull the trigger,” she said. The $6 billion legal cannabis market is expected to reach $50 billion by 2026, according to Cowen & Co. Recreational use has been legalized in eight states, including California, and the District of Columbia. Medical use is allowed in an additional 21, including New York. “I never thought we’d find an emerging market right here in the U.S., but here we are,” Leavy said. The firm is courting wealthy individuals like Epstein as well as family offices. The minimum buy-in for the firm’s second fund was $1 million, a level that rose to $3 million on Thursday, the company said. MedMen began as a dispensary and consulting company for the weed business in 2010. That gig turned into a management company in 2013, which spawned the idea to create a private equity fund. The firm has grown to nearly 300 employees, up from 15 at the beginning of 2016. The manpower is key to finding the few locations where the pot industry is allowed. Cannabis-related businesses, particularly stores, must be situated a certain distance from community centers such as schools and religious institutions. That makes snagging retail locations in high-traffic areas difficult but potentially more profitable. MedMen has bought or leased real estate in high-traffic locations, including midtown Manhattan, on the border of Beverly Hills in Los Angeles and just off the Las Vegas Strip. In total, MedMen’s management group and two funds own or operate 11 businesses: eight dispensaries, two growing facilities and one manufacturing plant. Another growing and manufacturing facility in Reno, Nevada, is expected to begin operations this year. The company is closing deals in Santa Monica and Venice, California, among others. It spent $26 million to acquire a company that had one of two licenses for a dispensary in Manhattan. On a recent Saturday, Leavy and Bierman spoke with a group of about 20 potential investors at the Four Seasons hotel near Beverly Hills. The company has held three such events this year. The two entrepreneurs sought to quell fears about the regulatory ambiguity that they say makes the opportunity so great. The group then took a tour of MedMen’s dispensary in West Hollywood and a growing facility 30 minutes away. Canopy Growth forms strategic partnership with Jamaica's JA Ltd.